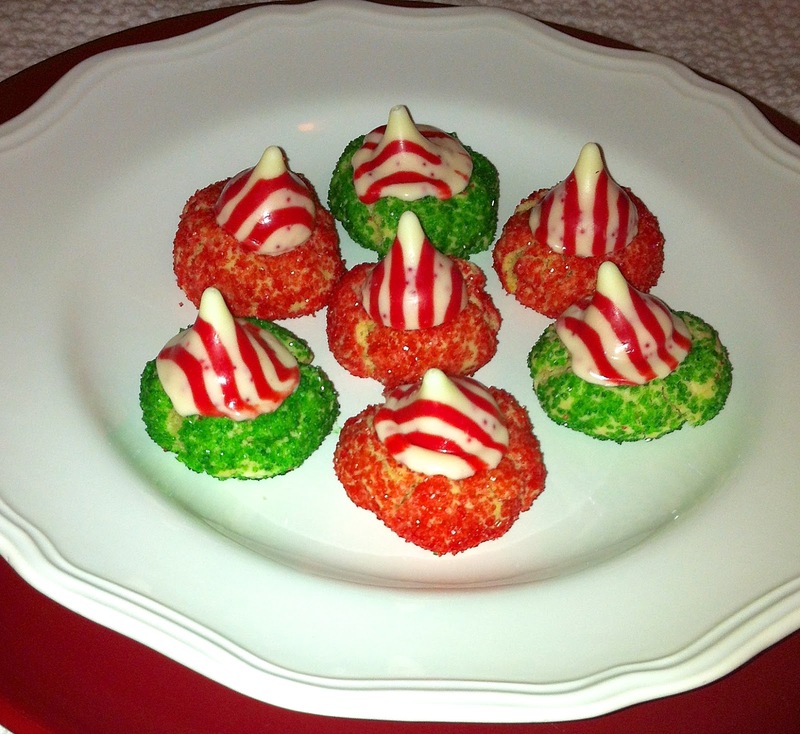 More holiday baking fun! Just put on some Christmas music, fix yourself a nice hot cup of coffee or hot chocolate, and let the baking begin!!! Preheat oven to 350 degrees. Unwrap kisses and set aside. Cream butter and Splenda, then add eggs and vanilla. Mix until well blended. Add dry ingredients and mix until combined. Shape balls into about 1-inch balls. Roll in colored sugar and place on cookie sheet. Bake 8 minutes, remove and place Hershey kiss on top of cookie, pressing down slightly. Let cool and enjoy! If you'd like a printer-friendly version of this recipe, Click Here. Cranberry sauce is a staple at my house whenever we enjoy any holiday meal. I'm sorry to say I've always bought canned cranberry sauce in the past; but I did go out of my way to buy two kinds... whole and jellied. I thought several times about making my own, but placing two cans in the shopping cart seemed much easier. Until now. There are a lot of complex recipes for cranberry sauce; so you don't have to worry about finding those kinds of recipes on this blog. This very easy, healthy, fresh, and extremely low-point recipe will hopefully make you never want to buy canned again. Heat orange juice, water, Splenda, and all spice in a medium sauce pan over medium-high heat until it starts to boil. Reduce heat and add cranberries. Cover and let cook for about 10 to 12 minutes, stirring occasionally. Let cool and enjoy! If you'd like a printer-friendly version of this recipe, Click Here. Perfect for these cold fall days, this chicken and chorizo stew has a hearty taste with a little kick. 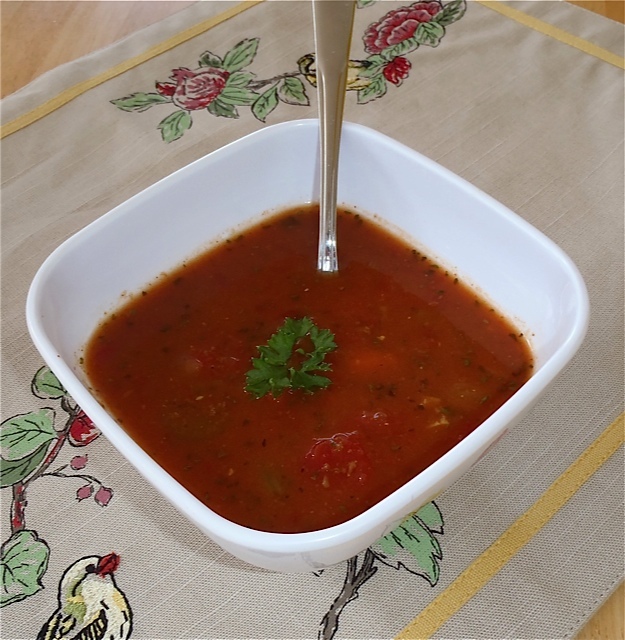 In a large saucepan or stock pot, combine the first 6 ingredients over medium-high heat. Add chicken breasts and bring to a boil. Reduce heat, cover and let cook for about 15 minutes or until chicken is cooked through. Meanwhile, remove casing from chorizo and set aside. In a large bowl, add potatoes, onion, red pepper, garlic, cumin, and salt. Set aside. Remove chicken from saucepan and let cool. Strain cooking liquid through a fine sieve over a bowl; discarding solids except for the carrots. Return saucepan to heat and add butter and chorizo. Sauté for 2 to 3 minutes, chopping the chorizo into pieces. Add the bowl of potatoes and onion mixture to the chorizo and sauté for 8 minutes. Return cooking liquid (broth) and carrots to the saucepan and let cook for about 15 minutes until the potatoes are tender. Add chicken and cook for 5 more minutes. (If the stew looks more like a soup, remove about 1 cup of the liquid broth. Combine 2 Tbs flour to a jar with a lid, add a little water and shake vigorously. Stir flour mixture into saucepan to thicken the liquid. Ladle stew into bowls and enjoy! Seasoned to perfection! These beautifully sauteed scallops are very tasty and very low point. Enjoy with *quinoa, rice, veggies, or with a healthy side salad. Cook quinoa according to directions. Rinse and pat dry the scallops. In a large skillet, heat butter over medium-high heat. On a plate, combine flour, thyme, oregano, and salt. Roll scallops in flour mixture and add to skillet. Brown for 3 minutes on each side. Remove and enjoy! Sprinkle a few almonds on top to add texture. If you'd like a printer-friendly version of this recipe, Click Here. *Quinoa is an ancient grain from South America. It has a mild, slightly nutty flavor similar to couscous. Use in place of rice in soups and side dishes. Quinoa also makes a great hot breakfast cereal. A few weeks ago, somebody asked me a question that really got me to thinking. We were talking about the hospice patient I visit and they asked me if I thought "hospice has changed me." I've been visiting a hospice patient for six months now. When I first started visiting with him, although he wasn't able to talk or show emotion, he was still able to shuffle around slowly with his walker, feed himself, and change the channels on the TV remote control (over and over and over). When asked a question, he could give me a thumbs up or down for "yes" or "no". Once I took him a frozen strawberry jello yogurt pie. After taking a few bites, he turned to me and gave me a thumbs up. That thumbs up got him a pie, every single week, after that. Whenever I walked in, his wife would turn to him smiling and say, "Oh look, it's your girlfriend who brings you your favorite pies." Since my patient can't verbally communicate, I fill our visits with information about my family, the weather, how wonderful his yard looks all of the time, and how much I enjoy visiting with him. I even give him permission to give me a "thumbs up" if he would prefer to eat in silence. But he never does. He listens intently as he takes another bite of pie. Lately, my visits have changed. I still ramble on about things I'm just sure he's interested in (or so I'd like to think) but I no longer get any thumbs up or down. He hasn't been able to "walk around the block" with his walker (which is what his wife and I call walking the circle through the kitchen, dining room, to the living room) and he can no longer feed himself. Most of the time he sleeps and even when I raise his bed to the sit position to feed him, he keeps his eyes closed... until I put a bite of strawberry pie in his mouth. Only then will he open his eyes and look at me, possibly putting together this is the "girl" who brings the pies. I finish each visit by patting his hand telling him I love our visits and how precious he is to me. At my last visit, I told him this Thanksgiving I will be thanking God for the blessing he has been to me. His saintly, loyal, and most wonderful wife called me today to tell me he is now in heaven. The tearful conversation was of sadness and joy, of heartache and praise. You grow so much being a hospice volunteer. You learn so much being a hospice volunteer, and if you allow yourself to go through the entire process with the family, you find it does actually change you; and for that, I am truly grateful. His entire family was there, reluctant to let him go, but lovingly assuring him they will be ok. It was that loving act of letting him go, that will now allow him to truly live. Before we hung up, his wife wanted to let me know they celebrated his life by enjoying a piece of his frozen strawberry jello yogurt pie that his girlfriend brought over just a few days before. "You're stronger than you think. Go out and do good. No cooking and no baking ... already a reason to give thanks! A Thanksgiving dessert you can make in just a few minutes! Light and fluffy and full of flavor, a dessert your family will love! In a bowl, combine cream cheese, pumpkin, and Splenda until blended. Fold in cool whip. Fill mini pie crusts with pumpkin mixture and top with 1 Tbs cool whip lite and sprinkle with cinnamon. Enjoy! If you'd like a printer-friendly version of this recipe, Click Here. I'm a big fan of curry, so when I came up with this recipe I was eager to taste the finished product... and I am going to have to give myself a hand. :) The perfect mixture of ground mustard seeds, curry powder, and honey; this succulent dish will please your palate and leave you feeling completely satisfied! In a large skillet, heat the olive oil over medium-high heat. Add chicken and season with salt and pepper (to taste). Brown chicken on both sides for several minutes. In a bowl, combine chicken broth, mustard seeds, curry powder and honey. Whisk in corn starch. Pour mixture over chicken, turn down heat to medium and cover for 10 minutes (or until chicken is no longer pink in the center). Prepare rice according to instructions on bag. Remove chicken from skillet, leaving chicken broth mixture. Add rice to skillet and mix with broth. Spoon 1/2 cup rice onto a plate and add 4 oz. chicken. Enjoy! If you'd like a printer-friendly version of this recipe, Click Here. Perfect! Sundaes you can eat not only during the heat of the summer, but enjoy throughout the winter months as well! At one point per sundae, choose strawberry or caramel and indulge in this delightful dessert. Combine cream cheese and powdered sugar. Fill 30 mini fillo shells with cream cheese mixture and top with 1/4 tsp. caramel syrup or strawberry spreadable fruit. If you'd like a printer-friendly version of this recipe, Click Here. I love basil! So much so that just tonight I told my husband if Yankee Candle came out with a basil-scented candle, I'd buy it. To me, there's nothing like the smell of fresh basil. Knowing that colder temperatures will soon be upon us, the thought of my healthy and bountiful basil dying outside makes me almost as sad as hearing we're out of coffee! I definitely wanted to find a way to preserve my basil so I can use it all throughout the winter months in soups, stews, sautés, and my favorite, "pesto"! I didn't harvest all of the basil just yet, because I still love using the fresh leaves in a lot of my recipes; so soon, I will be moving my basil indoors. Tonight I harvested and preserved about 8 cups of fresh basil leaves, and it's one of the easiest things I've ever done. It would have been about 10 cups of fresh basil but I couldn't do anything without first making up a batch of one of my favorite appetizers ever... BRUSCHETTA! It's really more of an entree for me since I eat so much of it. Getting back to preserving basil, there are several ways to accomplish this. The method I used was adding the 8 cups of leaves (stems removed) into a food processor and pulsing the basil while drizzling about 1 1/2 to 2 Tablespoons of olive oil into the mixture. Without the olive oil, the basil leaves will blacken in the freezer. After pulsing the leaves until all the oil is combined throughout, place the mixture into a gallon-sized freezer bag, sealing the bag while pushing out as much of the air as you can. Flatten the mixture to fit about 1/3 of the bag -- into a rectangular shape. The best part about preserving the basil leaves this way is once the mixture is frozen, you can break or cut off any amount you desire to be added to your favorite recipes. The basil will last up to 6 months in the freezer. Cook bacon until crisp; cool, crumble, and set aside. Steam broccoli 4 to 5 minutes or until crisp-tender, drain if needed, and set aside. Cook pasta in boiling water in a large saucepan over medium high heat for 8 to 10 minutes or until al dente. Drain and keep warm in a separate dish. Return pan to heat and melt butter in the pan, add milk, and sprinkle in flour whisking until slightly thick (about one minute). Remove from heat and add cheese slices; stirring until smooth. Stir in diced green onions, salt, pepper, and cheddar cheese. Add broccoli, pasta, and bacon to pan and combine thoroughly, serve immediately, and enjoy fully! :) If you'd like a printer-friendly version of this recipe, Click Here. This perfectly baked fish with succulent sautéed brussels sprouts has your mouth watering before taking one bite. 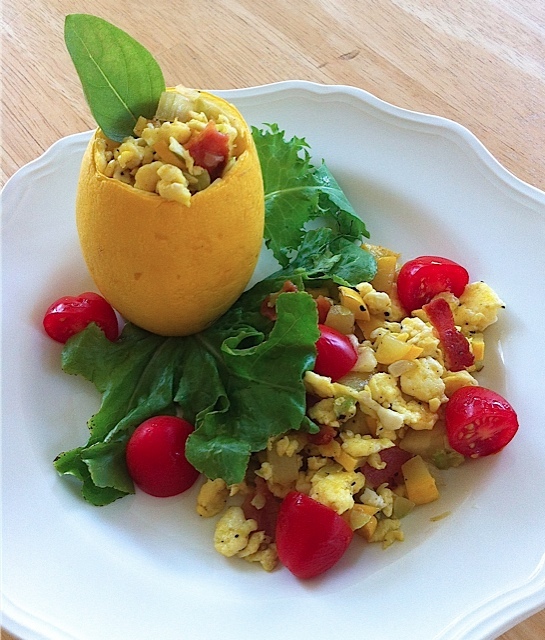 Healthy, savory, and fulfilling... something you're sure to enjoy! Preheat oven or grill to 400 degrees. Place one fish filet on a separate piece of aluminum foil. Season each with the lemon and pepper seasoning, add 1/2 tsp. of olive oil on each fish, and sprinkle with fresh basil. Wrap fish in foil and bake for 8 to 10 minutes, turning over once after 4 minutes. Meanwhile, in a skillet, fry bacon until crisp. Remove bacon to plate, leaving hot bacon grease in skillet. Add tomatoes, onions, garlic, and carrots to skillet and sauté for 2 minutes before adding brussels sprouts, 1 Tbs olive oil, salt and pepper, and crumbled bacon strips. Turn heat to low and cover, stirring frequently until brussels sprouts are tender but not mushy. Dish one cup of brussels sprout sauté to plate and place one piece of fish on top. Enjoy! If you'd like a printer-friendly version of this recipe, Click Here. Fresh, light, filling, and as always, scrumptious!! A terrifically tasty meal you can feel good about! Cook bacon until tender/crisp. Combine chives, basil, mayo, vinegar, garlic, salt, pepper, ranch dressing, and feta cheese. Slice tomatoes and avocado and alternate layers on two plates. Drizzle 1/2 Tbs olive oil over each tomato stack. Cut corn kernels off of cob and scatter evenly on plates and on top of tomato salad. Spoon ranch dressing mixture evenly on top of each tomato and avocado stack. Crumble bacon and sprinkle on each salad, garnish with fresh basil leaves and enjoy! If you'd like a printer-friendly version of this recipe, Click Here. Light, refreshing, and full of flavor -- this watermelon caprese salad has the right mix of sweet and sour. With fresh watermelon, tomatoes, mozzarella and basil, it's a unique twist on a summer salad that will have you going back for more. Combine the tomatoes, watermelon, mozzarella, and a little bit of salt and pepper in a bowl. In a separate small bowl, mix onion, basil, balsamic vinegar, olive oil, sugar, lemon zest, and lemon juice. Drizzle over tomato mixture and combine gently until thoroughly saturated. Drain a little bit of the excess balsamic mixture. Enjoy! If you'd like a printer-friendly version of this recipe, Click Here. Watch out, they'll be gone in a flash! These delicious, easy-to-make taco bites are the perfect appetizer for any occasion. Tostitos' Scoops filled with refried beans, guacamole, shredded cheese and a dot of sour cream. A one-bite sensation and must-try recipe! Preheat oven to 350 degrees. Line a cookie sheet or shallow baking pan with aluminum foil. Place Tostitos' Scoops on baking sheet and spoon 1/2 teaspoon of refried beans into the center of each scoop. Sprinkle just a pinch of shredded cheese on each scoop and place in the oven for 3 to 4 minutes, until cheese starts to melt. Meanwhile, peel and remove seeds from avocados. Mash avocados and stir in guacamole seasoning mix. Stir until well combined. Remove baking sheet from the oven and place 1/2 teaspoon of guacamole mix on top of refried beans and cheese. Dot taco bites with about 1/4 to 1/2 teaspoon of sour cream and insert into mouth! Enjoy!!! :) If you'd like a printer-friendly version of this recipe, Click Here. Preheat oven to 400 degrees. Season Swai with pepper and Adobo seasoning. Line glass pan with Swai and bake for 15 min. (or until desired doneness). Meanwhile, add basil and pine nuts to a food processor and pulse until basil is chopped fine. Add garlic, cheese, and olive oil and pulse until all combined. Drizzle in water and add salt and pepper to taste. Pulse a few times more to ensure all is combined well. Remove Swai from oven and enjoy with this delicious rich and thick pesto. If you'd like a printer-friendly version of this recipe, Click Here. Root beer? What?? Imagine the taste of sweet sassafras or fresh anise in a barbecue sauce with just enough kick to make it even more interesting. 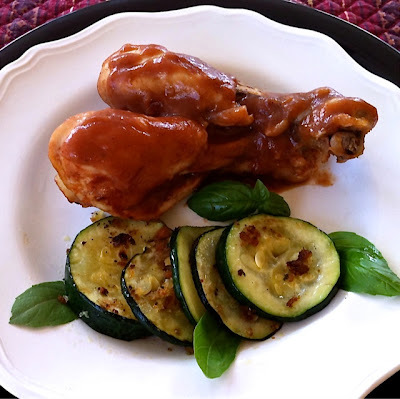 Thickened slightly to coat these tender chicken legs, this sauce has a fresh taste that will delight your palate and leave you wanting more. Give it a try! Place chicken legs into a crock pot. In a small bowl, combine ketchup, root beer, creole seasoning, and salt. Pour over chicken and cook on high for 3 hours (or until done). Remove chicken and add the flour to the sauce, whisking until slightly thickened. Drizzle sauce on top of chicken and be prepared to be amazed! If you'd like a printer-friendly version of this recipe, Click Here. Blessed with an abundant amount of summer (yellow) squash this year from our garden, I'm always trying to create great new recipes that are filling and delicious. This recipe is just that! Light, flavorful, and filling -- a must try recipe I'm sure you'll want to repeat! Cut the bottom half (fattest part) of the summer squash and then a little slice off the very bottom so the squash cup stands upright (see photo). Scoop out the insides of the squash (leaving a thin layer of squash to create a vessel or cup to hold contents). Dice squash along with remaining (top part) of the squash and combine with garlic, onion, and seasonings. Set aside. Fry the bacon in a large skillet until crisp. Remove and set aside to cool. Using bacon grease, add squash mixture to hot skillet and saute' for several minutes. Remove squash mixture to a bowl. Crack both eggs into a bowl and add the milk. Whisk eggs until smooth and add egg mixture to the same hot skillet. Stir frequently until eggs are cooked through and scrambled. Combine eggs with the squash and crumble bacon into the mixture as well. Before spooning the mixture into the squash cups, place the squash cups on a microwavable-safe plate and cook for 2 minutes in the microwave. Spoon squash mixture into the squash cups and set on a bed of lettuce (if desired). Spoon remaining egg and squash mixture next to the squash cup on the same plate. Garnish with tomatoes and serve. Enjoy!! If you'd like a printer-friendly version of this recipe, Click Here. Combine cream cheese, powdered sugar, and vanilla. Set aside. Remove stems from strawberries. Cut around the top of the strawberries and remove the insides with a paring knife (as much as you can). Fill piping bag (or Ziploc sandwich bag with the corner snipped off) with the cream cheese mixture. Fill strawberries with mixture, sprinkle 1/8 teaspoon of graham cracker crumbs on each strawberry, and place a blueberry on top. Enjoy right away or refrigerate (covered) overnight. If you'd like a printer-friendly version of this recipe, Click Here. One of my dear friends gave me this recipe and I just had to try it. Another very easy and FANTASTIC recipe that you can make and keep in the fridge ahead of time for a light lunch or dinner! Combine all ingredients and heat in a medium sauce pan. Voila'! Dinner is served! Enjoy! If you'd like a printer-friendly version of this recipe, Click Here. Light 'er up -- it's time to grill! :) Grilling season is upon us and regardless if you have an outdoor grill or not, most of the grilling recipes you see can be done exact same on an indoor grill pan just right on your stove. 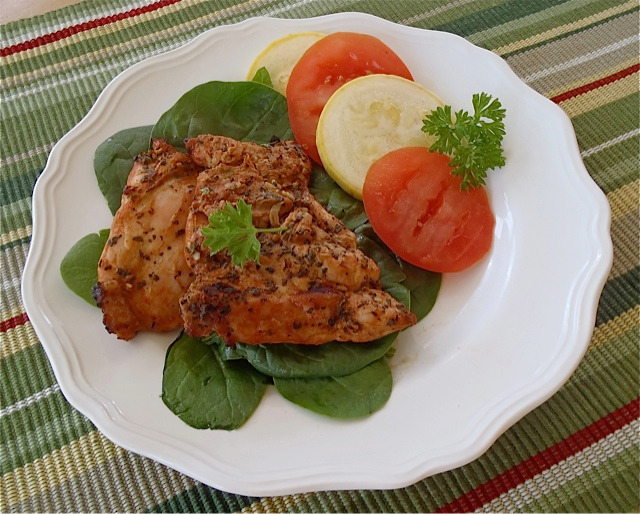 This savory recipe is an easy way to make your chicken very flavorful. So much so, you might be "grilled" until you hand over the recipe! Mix all ingredients together and marinate chicken thighs until thoroughly saturated. (If time permits, let marinate at least 30 min. ahead of time.) Place chicken on grill set to medium-high temperature. Turn thighs over every 2 to 3 minutes so they won't over cook. Remove when cooked to desired doneness, and enjoy! If you'd like a printer-friendly version of this recipe, Click Here. These mouthwatering sliders are a culinary delight! Made with mild Italian sausage and just the right amount of succulent sauce, you will easily see why this recipe will be at the top of your list! Heat one teaspoon of olive oil in a large skillet over medium-high heat. Add garlic and shallots to skillet and saute' for about three minutes. Remove and combine shallot mixture, salt, pepper, oregano, ricotta, parsley, panko, sausage, and egg in a large bowl. Shape mixture into 12 little meatballs and press down slightly to flatten. Return skillet to medium-high heat and add remaining two teaspoons olive oil. Add meatballs to skillet and cook for about 6 to 8 minutes, turning once. Reduce heat to simmer and add marinara sauce. Cover and let simmer for 7 to 8 more minutes (until meat is cooked through). Add a basil leaf to meatball before putting on the top bun. Enjoy! If you'd like a printer-friendly version of this recipe, Click Here. This new patient was far different. Only able to give me a thumbs up or down for yes and no (and sometimes getting those mixed up) he moved about with his walker ever-so-slowly, walking circles around the few rooms he visited each day, almost as if he were searching for something. 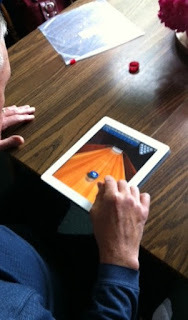 After watching TV and walking circles for about an hour, I decided to fire up my iPad and call up a few games. Encouraging this patient to have a seat at the table, I placed the iPad in front of him. Looking down at a Bowling game I called up, he immediately gave me a "thumbs down"; but after seeing him eat a wonderful lunch and doing a fantastic job at feeding himself, I decided his limited mobility didn't include not being able to use his finger to push a virtual bowling ball down a lane. After taking his finger and demonstrating how to play... several times.... he got it! STRIKE -- at one of his first attempts! Although he made no expression at his champion bowling skills, the cheering section clapped and hollered, "YOU DID IT! GOOD JOB!" With still no expression on his face, I can only assume his glance at me was either to say, "Thank you" or "Keep it down, "cheering section!" Regardless, we celebrated by mastering Angry Birds as well. Now I'm on a mission to find games he can play with just the touch of his finger. Being a hospice volunteer has made me not only reflect more deeply on what's really important in life, it's given me a whole new respect and admiration for these patients' true caretakers; their spouse, sibling, relative, or friend. It's almost embarrassing to be thanked over and over for taking a few hours out of my day that provides these caretakers a much needed breath of fresh air and a little time to regroup. "One person caring about another represents life's greatest value." 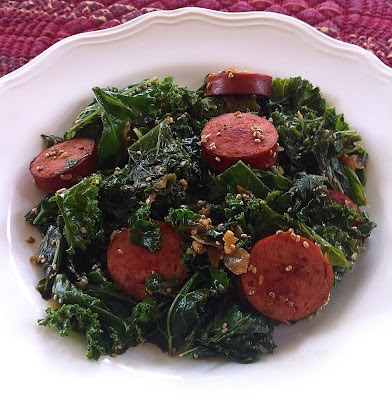 Sweet, spicy, and packed full of flavor; this sautéed sausage and grapes with seasoned kale is a fantastic recipe that you'll definitely want to make again and again! In a large skillet, heat one tablespoon of olive oil over medium-high heat. Add sausage and saute' until thoroughly cooked (breaking apart with a wooden spatula or spoon as you stir). Remove sausage to a plate when cooked and add remaining olive oil, grapes, salt, pepper, onion, and garlic to same skillet. Saute' for several minutes, stirring constantly. Add white wine and red wine vinegar, stir and let liquid reduce by half. Throw in kale and saute' until kale is slightly wilted. Add fresh grapes (if desired) to each serving and enjoy! If you'd like a printer-friendly version of this recipe, Click Here. 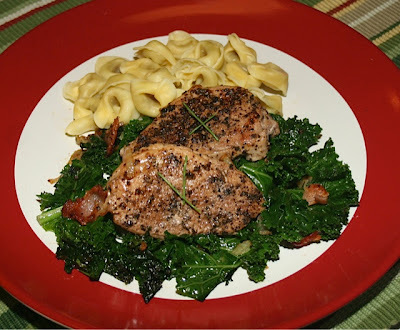 This perfectly seasoned pork tenderloin is very savory and satisfying! No sauce or condiments needed! Enjoy! Mix the salt, pepper, cumin, coffee, and onion powder in a bowl. Press seasoning mixture on slices of pork tenderloin, both sides. Heat olive oil over medium-high heat in a large skillet. Place seasoned pork tenderloin slices in skillet and sear on both sides. Turn heat down to medium and continue cooking pork until desired doneness, turning over several times to cook evenly. Remove and enjoy! If you'd like a printer-friendly version of this recipe, Click Here. Yum! Great for an appetizer, lunch, or dinner -- this Avocado Chicken Salad tastes amazing on a bed of lettuce or with Tostitos tortilla chips! Ideal for a delicious and healthy lunch to take to work as well! Combine first three ingredients in a medium bowl, stirring with a whisk. Add chicken and cilantro and combine well. Stir in salsa and avocado. 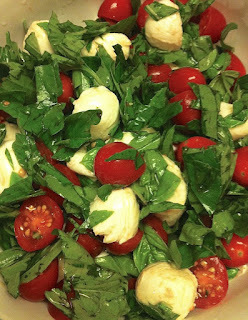 Garnish with two tablespoons of chopped basil. Serve on lettuce or tortilla chips. Enjoy! If you'd like a printer-friendly version of this recipe, Click Here. "Almost any difficulty will move in the face of honesty. When I am honest, I never feel stupid. And when I am honest, I am automatically humble."